A photograph is an effective form of communication and sharing as “A picture is worth a thousand words”. 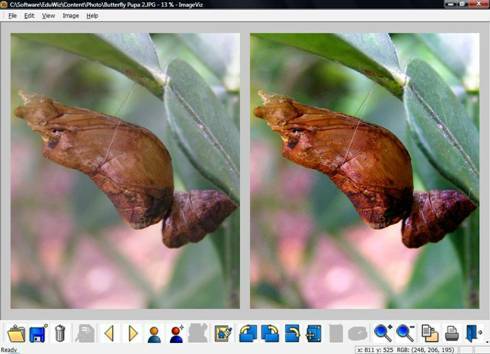 PhotoViz is a freeware with a set of innovative tools that extends the traditional uses of images. 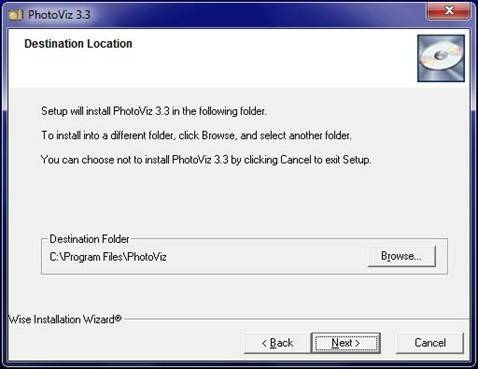 PhotoViz consists of a set of tools to automatically fix basic problems in photos, read secret messages, access content or view photo galleries embedded in images. All images can be viewed by any available image viewer software but nobody knows that the image contains hidden content. They looked just like any other images and with no loss in image quality. PhotoViz provides security and secrecy by ensuring that only the targeted audience can retrieve the contents in the image. The functional overview of PhotoViz is shown at Figure 1.1. PhotoViz functions are broadly divided into three categories: Image Correction, Content Access Control (CAC) and Active Photo (AP). Image Correction is a set of tools to automatically fix basic problems in digital photos and manage image files. Intuitive tools that adjust overall color, contrast, brightness and sharpness of the photos can be used to ensure that your photos look their best. You may resize, rotate your photos and even view imaging information. These tools are designed for casual photographers and business users who want to improve their photos for prints, emails, presentations and sharing on the Web. The Content Access Control Module encrypts digital content into images and can restrict access to the embedded content through the use of passwords or registration images. Registration Photos are special images that must first be viewed before users can access content in subsequent images. The CAC module has a built-in encryptor in PhotoViz and a free online encryptor in the Mail ++ portal (www.mailplusplus.com). Content that can be embedded into images are files (e.g. Microsoft Office documents, pdf files etc), URLs, Web-based content (e.g. Adobe Flash), Zip files and Windows applications. 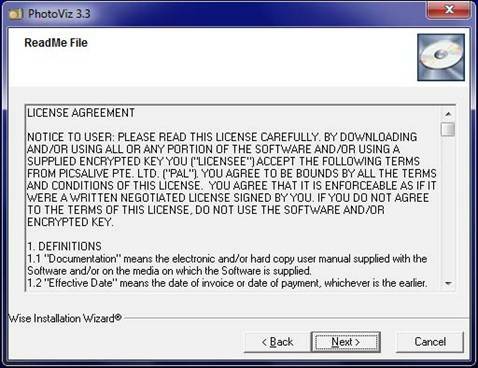 Note that the built-in encryptor has a 30 day trial and a licence must be purchased at www.picsalive.com after the trial period. Active Photo is a novel way of delivering content, web applications quickly and easily through the use of images. Active Photo offers an easier, more intuitive way to view, manage, and share your photos. Currently, there are two implementations of Active Photo: iphone Active Photo (or @Photo) and Active Gallery. 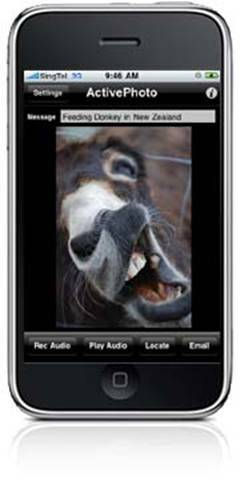 @Photo is an iPhone app that enables users to embed media such as messages, location data and audio files into photos (see Figure 1.2a). Photos from the iphone can shared and sent via email. Embedded media, location and the phone’s parameters can be accessed by PhotoViz. A free Lite version and a paid version of @Photo is available in Apple’s iTunes App Store. More information about @Photo can be found at www.picsalive.com/ap. Active Gallery enables users to create their own Photo Galleries and embed them into a single image. Viewers can also view a slide show, rate and add comments to the photo gallery. Active Galleries are created at the online OOOID portal (www.oooid.com) and can be viewed in PhotoViz. 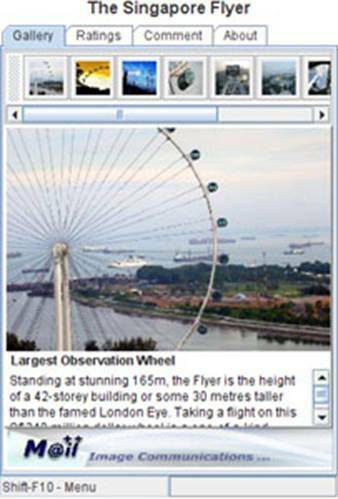 An Active Gallery on the Singapore Flyer is shown on Figure 1.2b. 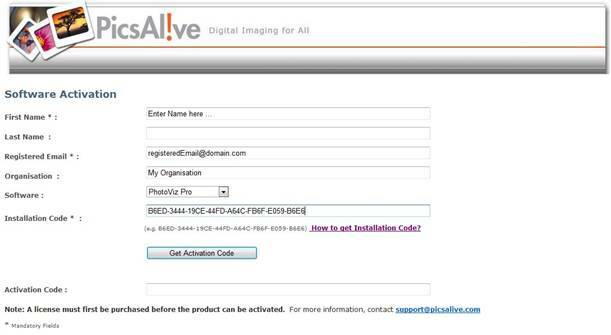 The Active Gallery can be viewed by in blogs or users’ websites by inserting a few lines of codes. Photos in Active Gallery are secure and can be shared online or offline with friends and family. 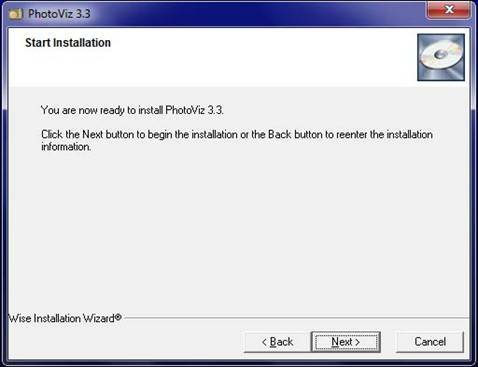 PhotoViz graphical user interface is simple and easy to use (see Figure 1.3). Thumbnails are used for easy viewing and help to quickly locate photos. PhotoViz functions are represented by quick access icons at the bottom for easy access. ImageViz (see Figure 1.4) is a user interface to view, tune and manage single images. ImageViz is integrated into PhotoViz. a. Embed Messages, Contents and Applications in Images with Access Control. Secret text messages and content can be encrypted and hidden in images. Images with hidden messages and contents can be viewed with any conventional image viewer software. They looked just like any other images and with no loss in image quality. Images are distributed via the email but access to hidden messages and contents can be restricted to the targeted audience through the use of passwords or registration photos. b. iPhone Active Photo. Messages, audio recordings, location data and phone parameters (e.g. phone identification number, name, model etc.) embedded into images can be viewed and accessed outside the iPhone using PhotoViz. c. Active Gallery. Active Gallery enables users to create their own Photo Galleries and embed them into a single image. Photo Galleries can be viewed by inserting a few lines of codes into the user’s blogs or websites. Viewers can also view a slide show, rate and add comments to the photo gallery. The Photo Galleries are secure and can be shared online or offline with friends and family. d. Automatic Enhancement of Photographs. Enhances and fixes common problems in photographs automatically. Parameters in the automatic process can be defined by the user. Semi-automatic and manual photo enhancements are also supported. e. Intuitive Photo Editing Tools. Intuitive editing tools such as image crop, resize, rotate, red-eye reduction, sharpening or softening are provided. 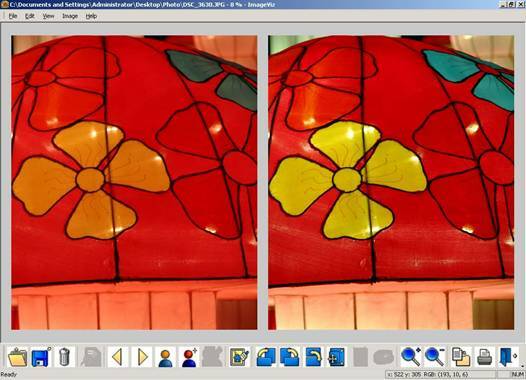 There are also tools for full color spectrum corrections tools to increase color vibrancy. f. Easy to use and friendly User Interface. The graphical user interface is based on thumbnails and icons for ease of use and accessibility. Real-time preview of photographs during editing and tuning. g. Special Photo Filters. Jazz up your photos with filters such Sepia, Yellow Tritone, Blue Duotone, Green Duotones and Grayscale. h. Directories and Files Management. 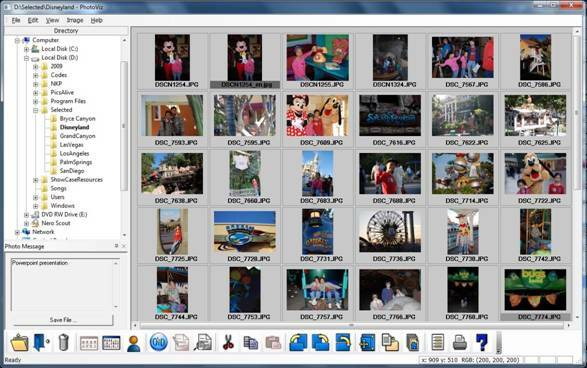 Users can easily copy, cut, rotate, edit, delete and create directories and image files. 1.2 What’s New in PhotoViz 3.3? Preserved Embedded Media. Embedded media in images is preserved when the image is modified and then saved. 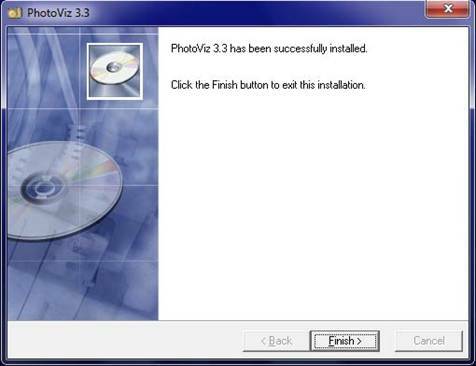 Installation of PhotoViz is simple and straightforward. 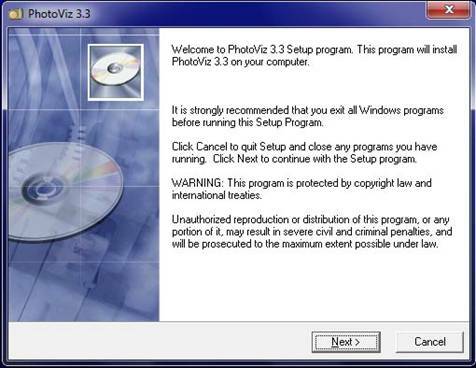 If a previous version of PhotoViz had been installed before, please uninstall the previous version first. 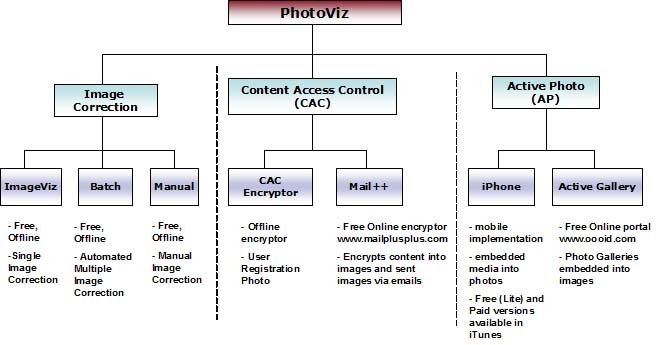 All functionalities in PhotoViz are free except for the Content Access Control (CAC). The CAC has a 30 day trial and a licence must be purchased after the trial period. (Note that users can still encrypt content using the free online portal at www.mailplusplus.com after the trial period). 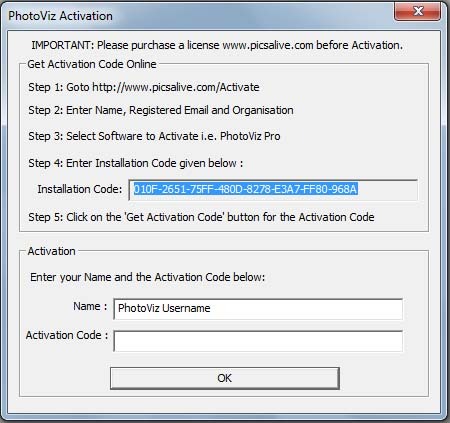 A licence for PhotoViz can be purchased by going the www.picsalive.com and select the “Purchase” button from the top menu (see Figure 1.11). Payments by all major credit cards or Paypal are accepted. If you have any questions or queries in PhotoViz, please contact us at support@picsalive.com and we will respond promptly.